Utilizing our state-of-the-art cutting machines, our bindery professionals will take your printed documents and cut and trim them to ensure the edges are crisp, clean and uniform from the first copy to the last. Bring us your job today and you’ll see the difference we make. Double-fold, parallel fold, tri-fold, Z-fold? No problem. We can machine or hand-fold just about any document into just about any format. For some applications, document numbering is essential to keep files organized and manageable. We can incorporate document numbering schemes into the printing of carbonless invoices, purchase orders and other business forms as well as tickets, invitations and other unique items. Contact us today for a free estimate. An excellent binding solution for small booklets and other printed volumes having a relatively small number of pages. 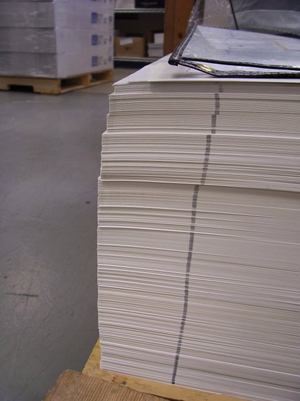 Scoring is the process of making a light dent along a straight line to ensure that folds made in heavier paper stock are crisp and clean from beginning to end. Depending on the requirements of the job, we can either machine-score or hand-score your documents. Whether your job demands the performance of machine scoring or the attention to detail of hand scoring, we’ll do it right. Perforation is one of those little details that, when done right, nobody notices; it just works. So when it comes to performing perforations for coupons, reply cards and other detachable collateral, we work very hard to go unnoticed. Contact us today and let us punch some holes in your next document! Take your mounted piece one step further with plastic trim and grommeting. Trim gives an added layer of protection—as well as an extra-professional look—to your materials. Grommets make it easy to hang your mounted pieces. To learn more, give us a call.